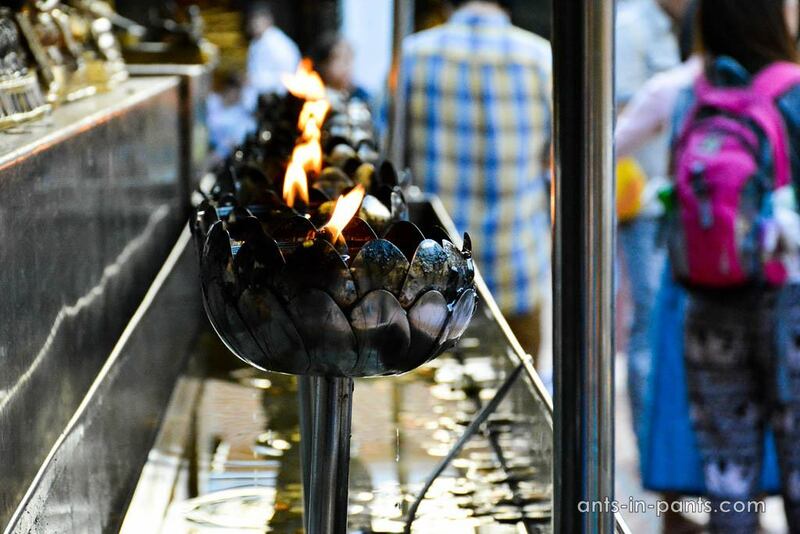 We came to Vietnam with mulptiple stereotypes drawn from the travellers’ forums and blogs (and similar to those we were going to Africa with), that is why our arrival to Ho Chi Minh from Kuala-Lumpur started with panics. 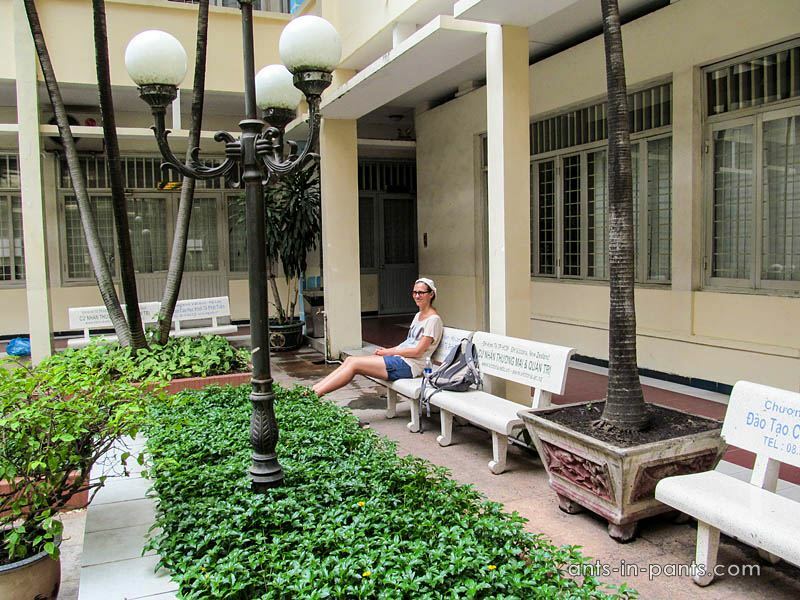 Later it started to feel much better, especially after we stayed with our Vietnamese couchsurfer, visited Ho Chi Minh museums and other attractions and tried Vietnamese cuisine. 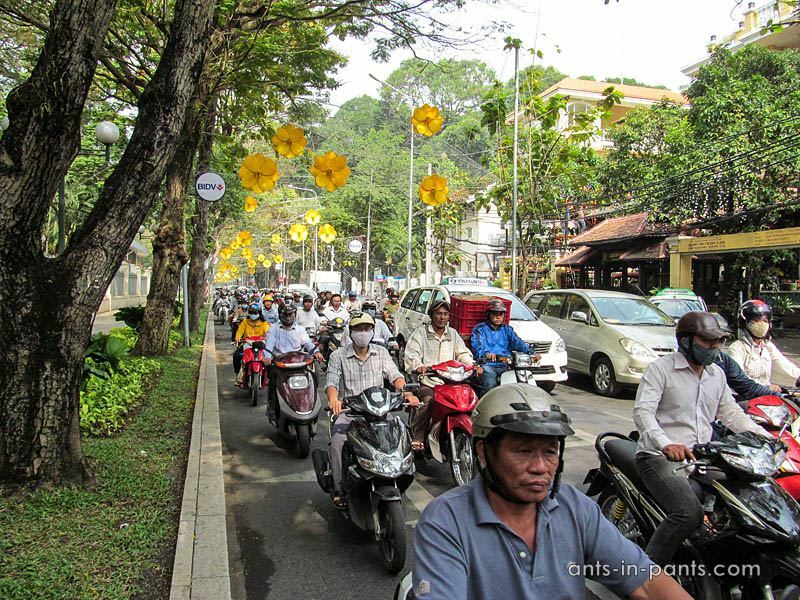 Even the traffic in Ho Chi Minh did not seem so scary as at the beginning. 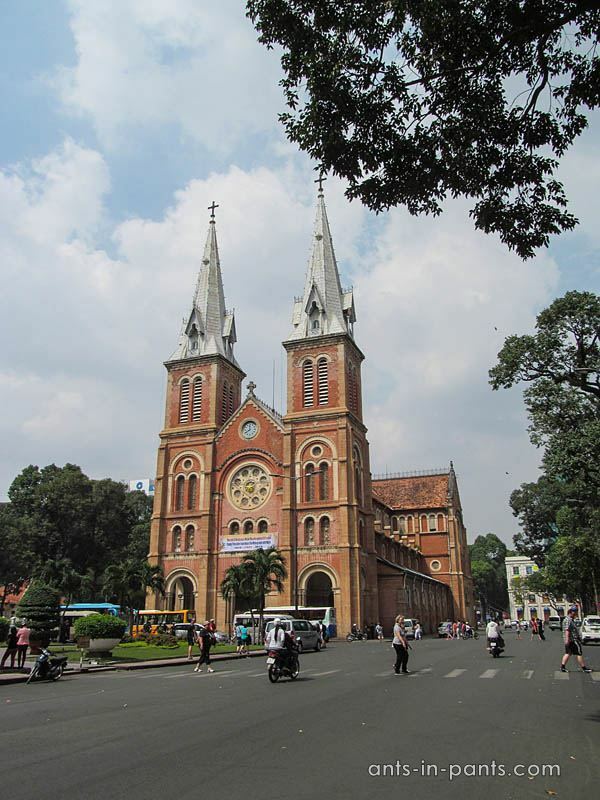 On our arrival to Ho Chi Minh airport, we went through the passport control, got our visas on arrival (they have been recently abolished) and learned from the information desk that it is possible to get out of the airport only by taxi. Of course, it seemed to us that the airport employees fooled us. We usually try to avoid the trip from the airport by taxi, as this is the number one way to cheat the stupid tourists in some countries. Indeed, we paid about 10 euros and our host told that we were cheated, not too much, but enough on Vientamese measures. Further in Vietnam we learned that there is mostly no public transport from the airport and we would have to deal with the taxi drivers further. We were staying with a couchsurfer Joe, a young man living with his parents. They have a shop on the first floor and their own house on the second. Joe’s mother made a soup with rice and meat for us and got very surprised when we finished the soup first: they do vice versa. Then we went to sleep. 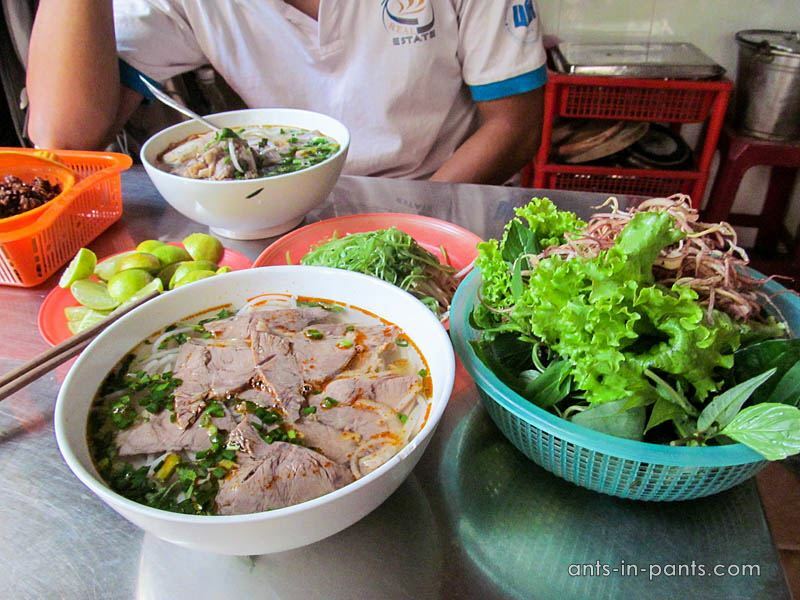 The next morning we started exploring Ho Chi Minh with the typical Vietnamese breakfast – banh mi sandwich, and the next shock after this pleasant food one became the public court trial in one of the central Hi Chi Minh streets of a woman accused of stealing. 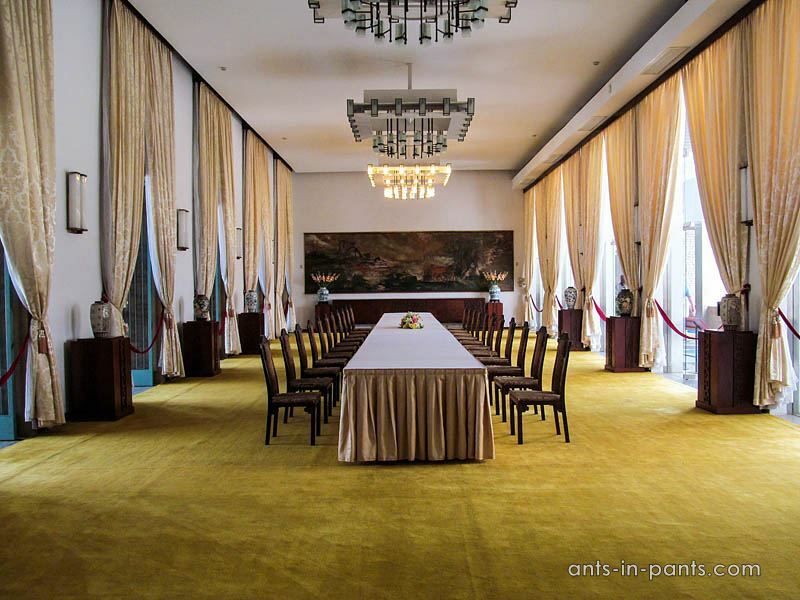 Scared of Ho Chi Minh traffic, we finally got to the Independence Palace (entrance fee 30000). The Palace was built in 1873, and since then it has been a witness to many events. The representatives of various regimes, including the colonialists governed from here. During the Vietnamese War the palace was bombed by to Vietnamese dissidents to kill the president Ngo Dinh Diem and his relatives who were also his political allies. Later the pilots claimed that they did it to destroy the authoritarian regime of Diem. One bomb got into the room where Diem was reading, but did not blow up, which allowed him to declare that he is under divine protection. Only one relative of Diem and several slaves died. 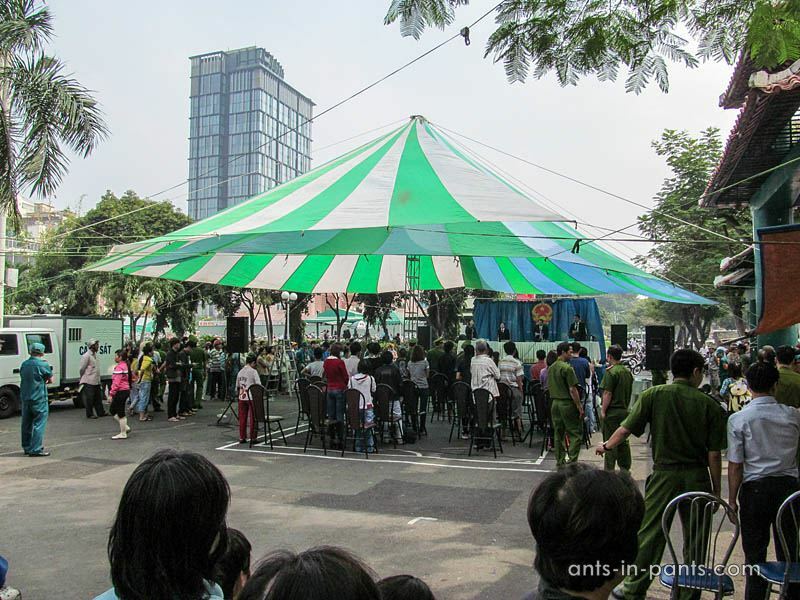 In 1975 a tank entered the gates of the palace symbolizing the end of Vietnamese War. 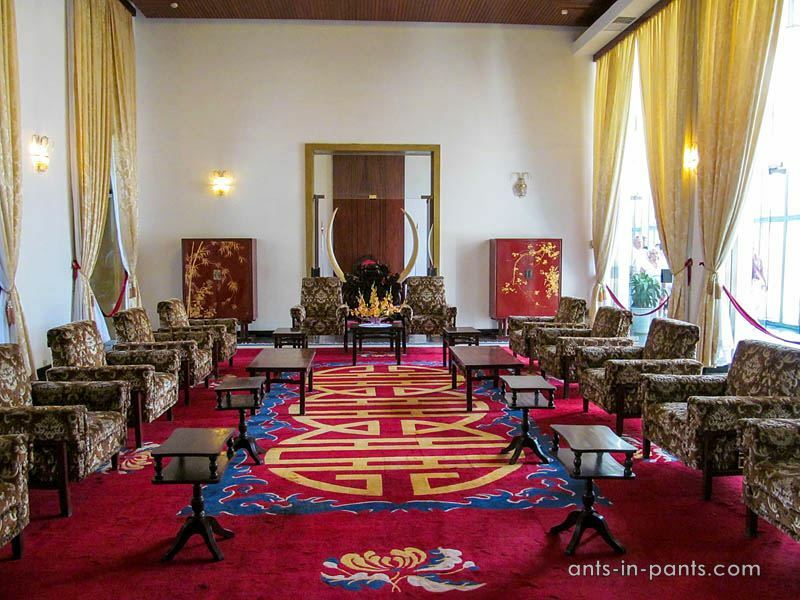 At the same year the agreements between Northern communist and the Southern Vietnam were signed here, after which the building received the name of Reunification Palace. 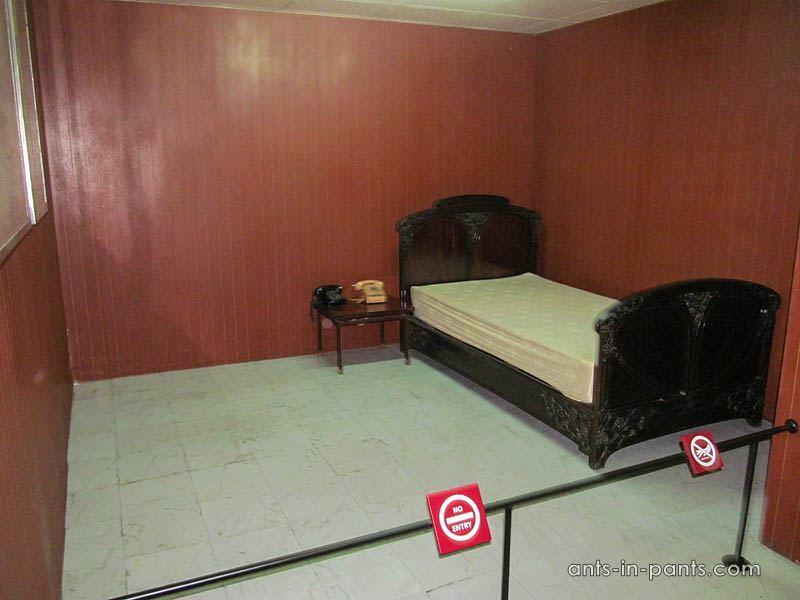 A tourist today may see the rooms of the palace and the bomb shelter. 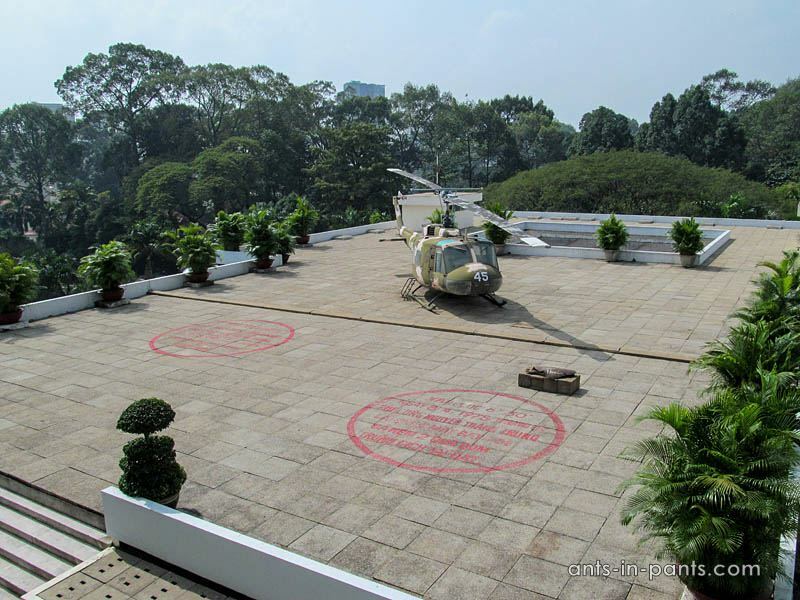 The last and the least successful bombing of the palace in 1975 by the communists is reminded of by a special sign at the place where the bomb fell and the president’s helicopter near it. Streets of Ho Chi Minh. Then we looked at the Notre dame cathedral of the times of the French colony nearby. 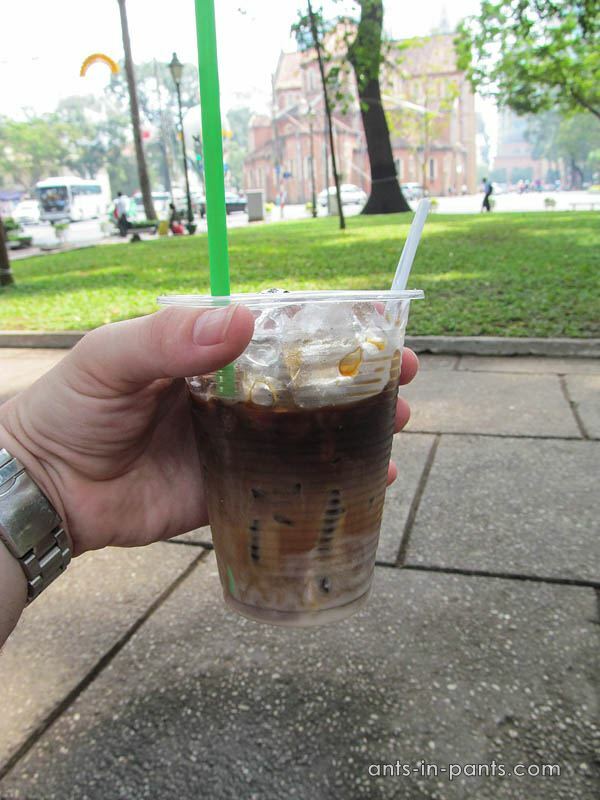 And tried some cold street Vietnamese coffee (to fall in love with it forever), watched the communist placards, the decorations of the city for the Chinese New Year, visited the university campus. For the first time we also tried Vietnamese Pho Bo soup – a huge plate of beef and other stuff and broth costs one dollar only. 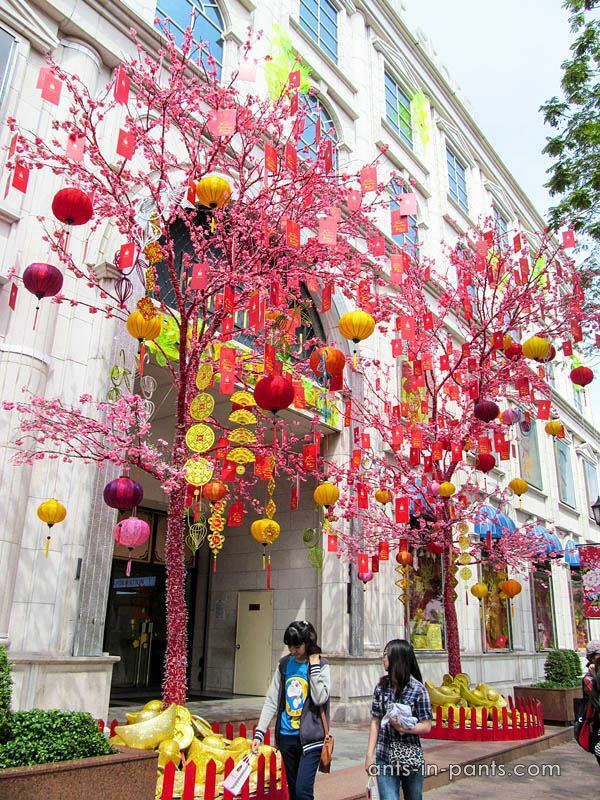 Museums of Ho Chi Minh. 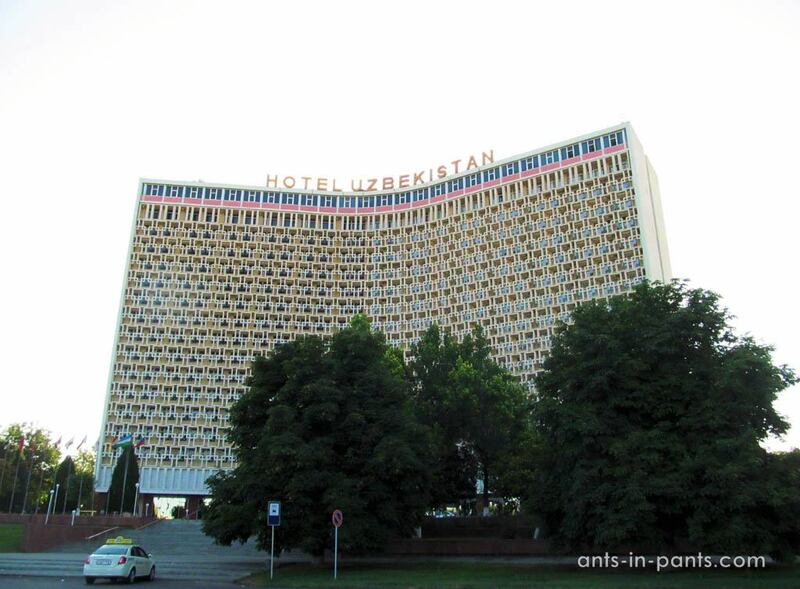 Next to the campus we found the international medical clinics: Vitya got the suspicious rash, but they asked 60 dollars for an appointment with allergist (with an average Ho Chi Minh salary of 100 dollars). We decided to recover by ourselves and went to the museum of Vietnamese War, which became the most impressive place in Ho Chi Minh for us. 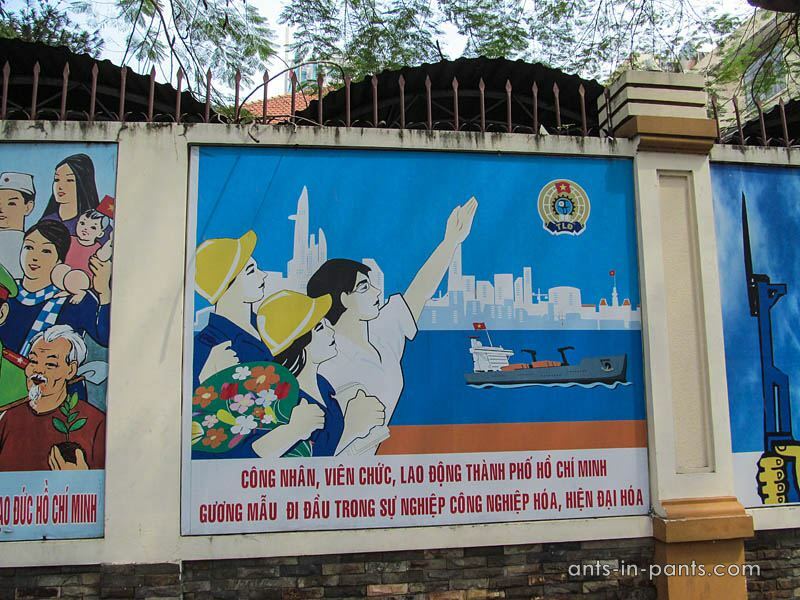 The war has once divided the north and the south of Vietnam into pro- and anti-communist movement correspondingly, which were supported by the USSR and China on the one side, and the USA – on the other. Interfering into the war, these countries did more harm to the Vietnamese than the inside conflict. For instance, according to the museum, all the US soldiers coming to Vietnam were given brochures stating that they come to help Vietnam and the whole Southeast Asia in its struggle with the communist aggression. But in fact they killed the civilians (including children), destroyed cities, and tried to stop their enemies not only with the bombs, but also with chemical weapons. The so-called Agent Orange gas was distributed from the planes, destroying not only the country’s present, but the future too: people poisoned with the gas give birth to several generations of sick children. A separate exhibition tells about children with different disabilities born after Agent Orange dissemination. One of the photos and commentaries to it also tells a contradictory story of an American who, being a soldier in Vietnam, got the dose of the gas himself. Coming back to the US, he decided to give birth to 11 children, all of which have heavy diseases. 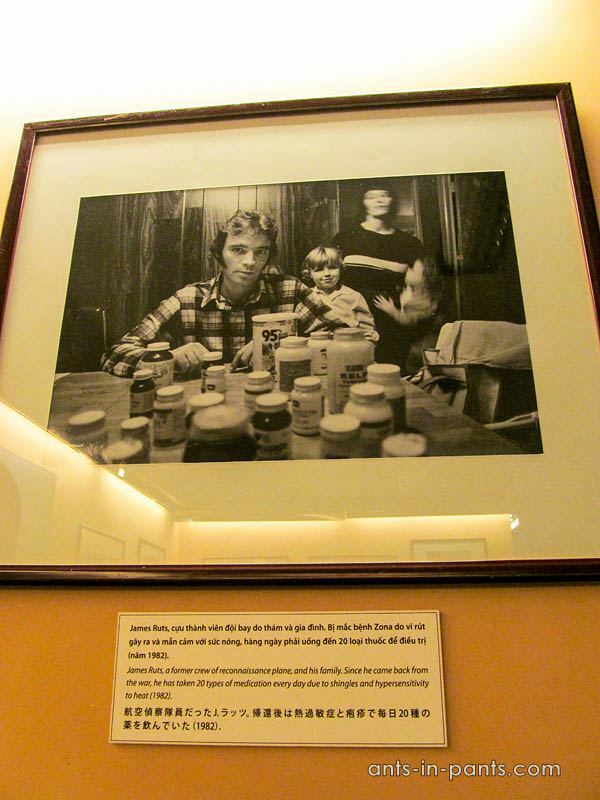 The photo shows James Ruts himself, taking his daily dose of medicines for the consequences of poisoning. The consequences Agent Orange had for the ecology are obvious too: toxic rains, polluted water sources, dead forests, etc. Little wonder that many Americans refused to serve in Vietnam on the moral reasons, protested against the American aggression in the US, and even burnt themselves alive to express their protest. 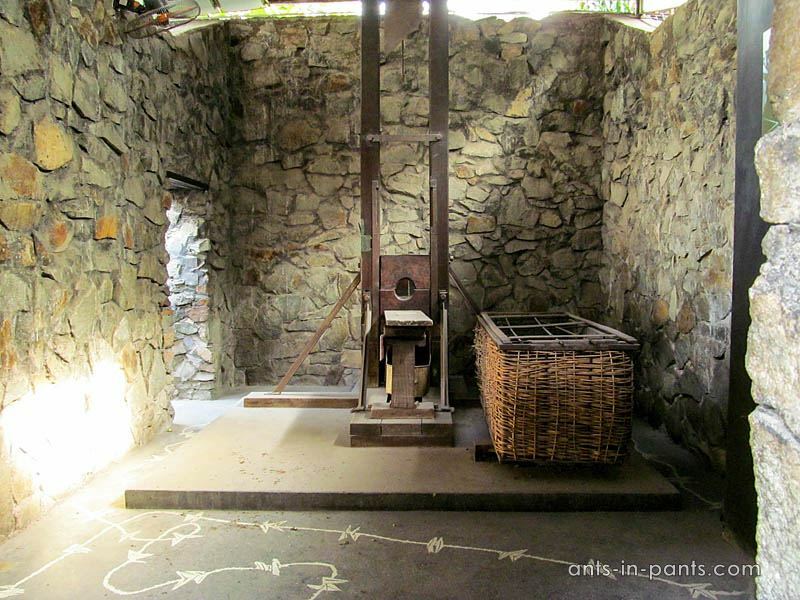 The museum of Chi Hoa prison also tells the story of French colonialists taunting the Vietnamese: for instance, it exhibits the guillotine and a box in which several Vietnamese waiting for the execution were kept at once. After two last depressive museums we had to cheer up. We got into the middle of the rush hour on the open public minibus, and this was very unusual for us. Although in the morning of the same day three of us were driving by one scooter by the oncoming lane, so we were almost local. 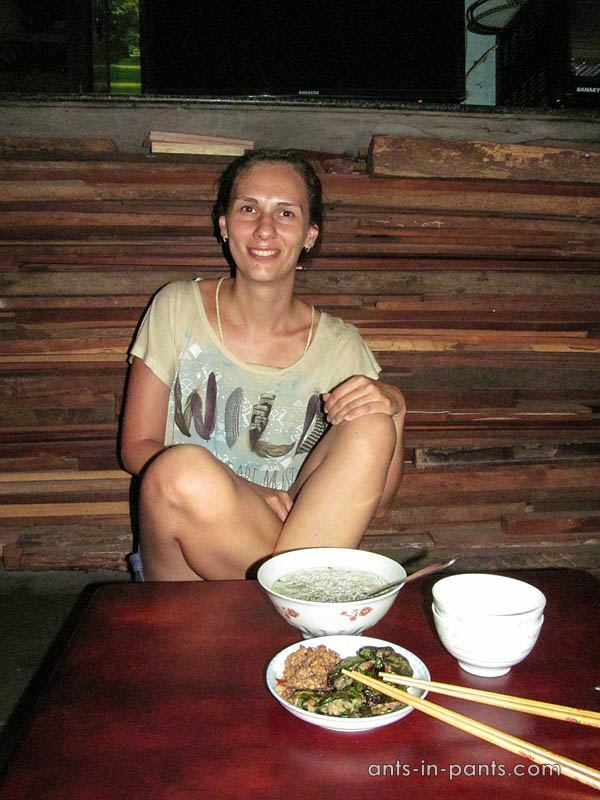 And in the evening we got to the restaurant in non-tourist district. Then we did not make much sense of the Vietnamese menu yet, and when we were trying to understand it not only the waiters, but also the guests ran by (it did not help a lot though: none of them spoke English). 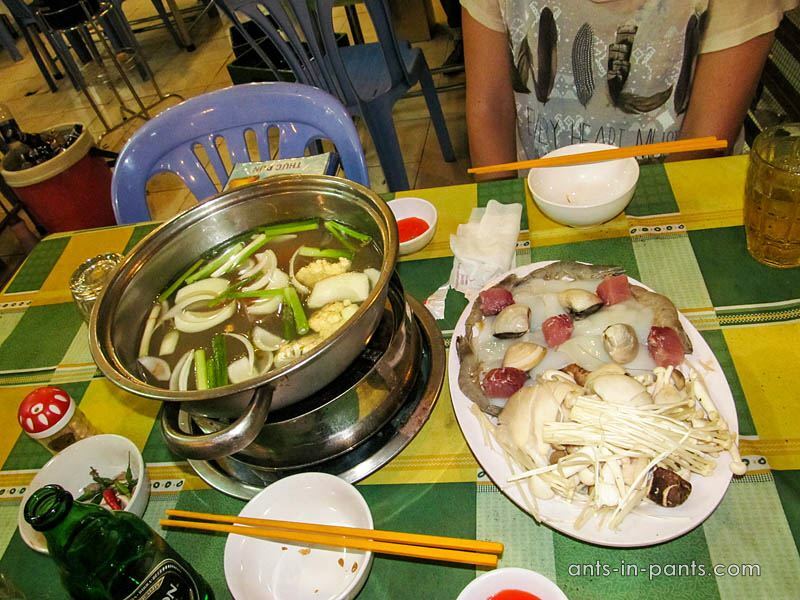 Yet, our attempts were rewarded and we received the famous Vietnamese nem rolls и and seafood hotpot. 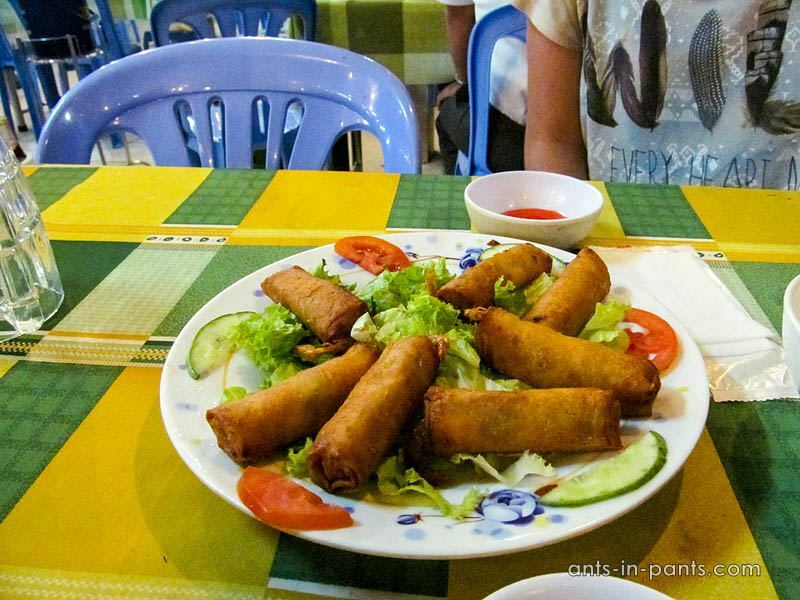 We paid only around 10 euros for a luxurious dinner with beer and not just loved, but adored Vietnamese cuisine. 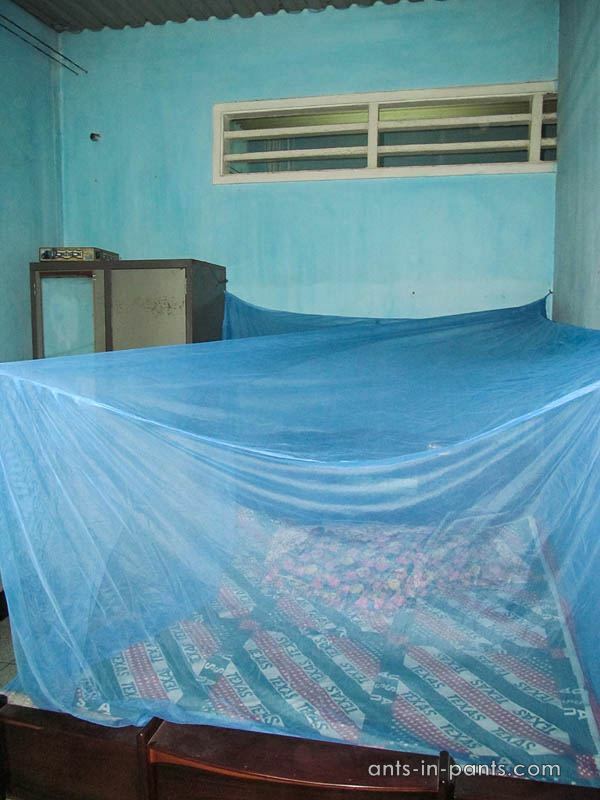 That is how we spent our first day in Vietnam, which turned out more than safe – simply great. 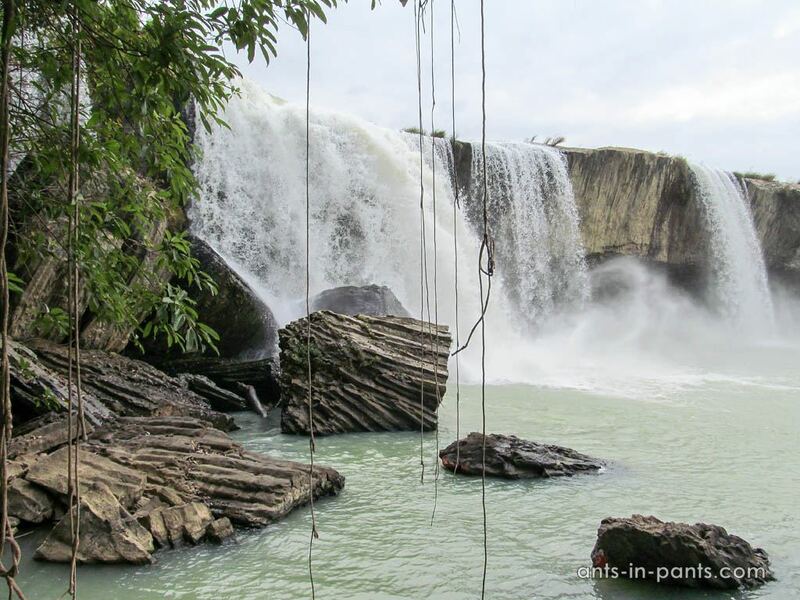 It seemed even greater the next day, when we came to Buon Me Thuot – completely different Vietnam, less visited by the tourists.